At Leigh's Catering we work closely with Chippenham's favourite venues; The Neeld Hall and Town Hall as their dedicated caterers. We have supplied catering for hundreds of newly-weds making their special day perfect. With our services your day will run smoothly and everyone will be looked after by our dedicated floor manager, whether its gathering everyone up for a toast, to personally greeting your guests with a pre-reception drink. 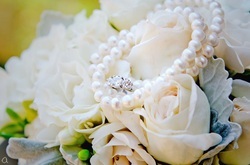 Prices for wedding ceremonies, receptions or breakfasts vary depending on your budget and guests. We would like to have a meeting with you to go over your requirements for food and drinks. Every wedding is different and very personal to all involved, so we like to personalise your menu, help with suggestions and ideas but, more importantly, keep it as stress free for you as possible. There is a lot we can offer you, not just in terms of catering but also service. If you need someone to set-up your tables - we can do this. Need contacts for DJ's? balloons? -we have this information or if you need a fully-licensed outside bar, just let us know. We supply all crockery, cutlery and waiting staff.